As bad as the drubbing was in Sunday’s Upper House election, the Democratic Party of Japan faces an even bigger, not to say familiar, problem — disharmony and lack of governance. The schism was again evident Wednesday when party members failed to decide whether to punish former Prime Minister Naoto Kan for supporting a candidate in the Tokyo electoral district who had lost the party’s endorsement. Kan’s backing is thought to have contributed to the crushing defeat the party’s favorite suffered. At the same meeting, members also discussed how to discipline Kan’s predecessor, Yukio Hatoyama, for recent comments that ran counter to the government’s official position on the Senkaku Islands and appeared to sympathize with China’s claim. “Many party members said ex-Prime Minister Naoto Kan and ex-Prime Minister Yukio Hatoyama negatively impacted the election results and called for severe punishment,” DPJ President Banri Kaieda said at the start of the meeting of ranking officials. Kan threw his support behind single-term Upper House lawmaker Masako Okawara, despite her loss of the DPJ’s endorsement just two days before the election campaign kicked off. Following the trouncing in the Tokyo Metropolitan Assembly election in June, the DPJ decided at the last minute to endorse only two-term lawmaker Kan Suzuki in the Upper House election, hoping to avoid dividing the vote. But Kan defied the party and endorsed Okawara, who was forced to run as an independent. Kan, who has become a staunch anti-nuclear activist since the March 2011 triple disasters, said Okawara was more in line with the party’s stance to seek nuclear phaseout by 2030s. In the end, neither Suzuki nor Okawara won a seat, and the DPJ failed to keep a seat in the Tokyo electoral district, which it had maintained since 1998. Following the crushing defeat in Tokyo, earlier reports said the party was going to recommend that Kan leave the party. But on Wednesday, ranking DPJ officials could not reach an agreement, as some said the party was partly to blame for making the last-minute decision to ditch Okawara in the first place. 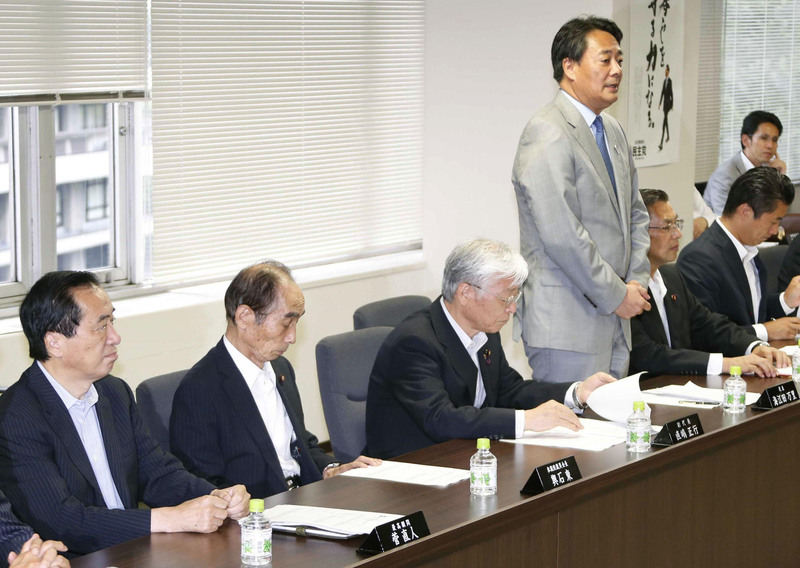 A party official said after the meeting that Kaieda encouraged Kan to decide on his own but Kan rejected this, saying he would obey any party decisions, whether they involved quitting the party or being expelled from it. 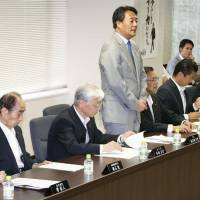 Kaieda and Secretary-General Goshi Hosono, who tendered his resignation Tuesday, were to discuss whether and how to punish Kan and planned to reconvene the ranking officials’ meeting this week to make a decision. Ranking officials Wednesday said Hosono can quit his post at the end of August after the party finishes a review of the defeat. The DPJ also said it will lodge a protest against Hatoyama, who retired from politics and left the party at the end of May. The party blamed him in equal measure for the DPJ’s trouncing on Sunday, saying he had damaged the party image by showing sympathy for China in an interview with Hong Kong-based Phoenix TV in the end of June.